After a bit of a break from DJ’ing because of work and travel, I’m lucky to be playing at some interesting parties in the next few weeks. The first one is tomorrow (Saturday) night at Galaxy at a new party called 三極管 (Sankyokukan). 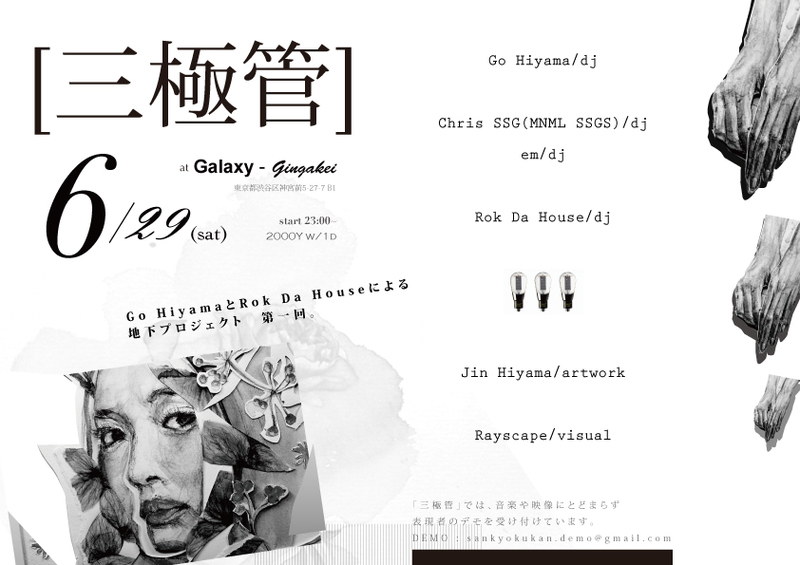 It is hosted by two established DJs in Tokyo, Go Hiyama and Rok Da House. I’m very glad to be joining em as one of the guest DJs. The idea with the party is incorporate a wider range of sounds beyond what you’d typically hear on the dancefloor, and also to have a strong focus on artwork and visuals. Galaxy is a really nice, comfortable venue and I’m really looking forward to playing there for the first time. For more details, check the event page on Facebook and RA. Also in a few weeks I am very happy to be playing at this year’s FREEDOMMUNE festival, which features an interesting lineup, including Milton Bradley, DJ Nobu, NHK’koyxen, and plenty of others. It’s free, but they ask for at least 1000 yen donation and you need to register in advance, which you can do so online here.